"A Fishing Buddy's Dream Come True"
This story starts some 10 years ago when my fishing buddy and I started fishing together. She really wasn't into the fishing thing as much as just getting out and catching some rays, but slowly and surly she began to get hooked. We had fished the banks of some local lakes and it was pretty slow when I got a call from a friend that knew of some strip pits where we could fish. I got all the gear together and off we went. Now most of you all know what it's like to fish out of Missouri strip pits. Some say it's like fishing out of a bath tub where you can catch up to 50 bass in a day. all weighing between 2 and 3 pounds. Well guess what? That's right. My fishing buddy was now and forever going to live and breathe the sport of fishing. We had been fishing about 5 years together when she and I went to this little lake. I will never forget this day as long as I live. It was a spring day and a hot one at that. about 80 degrees, the sky was high and bright blue. The fishing was fair, with only a few little ones caught. When she cast up next to this moss pile you would have thought the world had exploded! 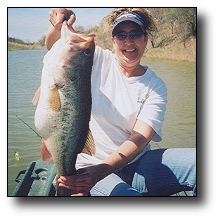 She hooked into a four pound largemouth and was shook up beyond belief. 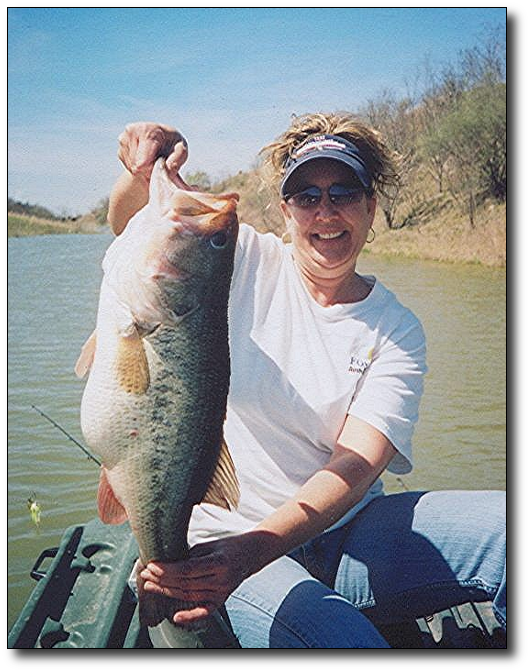 I remember her saying "take this I can't get it in," but she did, and the story continues...ever since that day, all I have heard from my fishing buddy is "all I want, is to catch a fish over 5 pounds." I mean that's all I hear every time we head out on another fishing trip. We all know you may wait a lifetime to catch a 4 or 5 pound fish and some fishermen never do. But this is where the story really gets good! I am a new member of HSP. She and I have made 3 trips down to some strip pits that the club leases. Of course I am hearing, "I sure hope I catch something over 4 pounds today." "It sure would be nice if I could catch that five pounder today," and the story goes on. This last March it was a beautiful day about 70 degrees and partly cloudy with 15 to 20 MPH winds. Not an easy day for the trolling motor operator, but for the back seat fishing buddy, things are always heaven when you can relax and wet a line. We had just fished this area that had produced a few small bass. I turned into the wind to back us out of some moss when she threw a spinner bait behind the 2 man bass boat when "ZAP, POW, BOOM!" It just so happened that when she got a hit she said "I have a fish on!" I stopped the trolling motor so she could fight the fish. My fishing buddy explained to me that the fish wasn't very big because it wasn't fighting very hard. But this old boy knew better! The fish was doing nothing but digging down and taking its sweet time about it too! Without her knowing it, I slipped my hand around the handle of the net next to me, and told her to take her time. The fish was getting closer to the boat and it realized that this isn't what it wanted and drove down underneath the boat. She fought the fish back to the surface and that's when she saw her prize! She had her wish that she had been dreaming about for many years! I told her to slide the fish over towards the net and she did it just like the pros. The next thing I will always remember: the net wrapped itself around the fish, and she became a new member of the lunker club. My fishing buddy had caught a fish of a lifetime! SEVEN POUNDS, TWO OUNCES! 23 inches long with a 21 and 1/2 girth Large mouth Bass. My fishing buddy began to shake and laugh. all the while, the tears of joy flowing down her face. Her dream had come true and my dream for my fishing buddy had come true also. Now all I ever hear from my fishing buddy is "I sure hope I can catch a largemouth over 8 pounds," and off we go on another fishing trip of a lifetime, and as always, the story continues. Remember when you're out having a great day with your fishing buddy to thank the good Lord for the wonderful day and, for your favorite fishing buddy. Good fishing to all and be careful. Editors note: Chris' fishing buddy just also happens to be his wife Phyllis.